Although it is not feasible for me to attend the conference this year, I have arranged a few things to help promote the book. SAMA conference-goers will find a beautiful postcard in their gift bags. As you can see from the back of the postcard, Kim Wozniak will have a copy of CREATIONS at her vendor booth for people to see and drool over. I have also donated two copies of CREATIONS to the raffle. No hill for a climber is my husband's favorite phrase of encouragement, often offered when anyone is feeling a bit daunted or facing some kind of setback. Such a setback came upon me about a month ago. We printed 500 copies of CREATIONS, only to have them rendered defective by a poor binding job. The binding issue was overall minor, but I felt it was unacceptable for this book—an art book—and for all the featured artists who put their faith in me to present their work in a professional and quality manner. So, we reprinted the books and sent them to a new bindery in Dallas. I received the books a couple of days ago and they are, like Mary Poppins, practically perfect in every way! The delay cost about 3 weeks but, since I was actually ahead of schedule, all is well. Tomorrow, 10 boxes of books will ship to an Amazon Fulfillment Center in Dallas. It will take a few days for the books to be processed and available, but it won't be long now. Rosangela Kusma Gasparin (front cover), Kirsten Jonas, Antoaneta Stoimenova, Sabine Schüle, Aida Valencia, Fernando Bekir, Jacki Gran, Jennifer Kuhns, Julie Burkhart-Haid, Kathryn Bernstein, Rhonda Dönges, Susan Burton, Yalily Mejia, and Allan Punton (back cover). Back in early December, I recruited three very talented and knowledgeable mosaic rock stars to review the book and possibly write a blurb for the back cover. They all graciously agreed to take a look at it and, after having done so, have generously written lovely mini-reviews, aka blurbs. On the little book site I set up, I've added a Chatter page containing the blurbs that are now on the back cover. Check out the chatter here! Currently, it's at 182 pages, with four pages allocated for the foreword. However, I've given Nancie a lot of latitude, so the page count may grow or shrink by a couple. I'm finalizing the back cover, and my chances of lining up a few highly regarded mosaic rock stars to review the book and contribute their expert opinion, in the form of back cover blurbs, are quite favorable. Final proofing for the book is moving along quickly. This is due partly to my desire to wrap it up before we are deep into the holiday season, and partly due to the responsiveness of the artists. There are just a few to be finalized. Originally, I had chosen 54 artists for the book. I suspected that I might lose a few who might have difficulty providing good enough images. Strangely, I did not lose any for this reason. As it turned out, I did lose 2 artists, but for other reasons. The first one declined to participate due to needing to help with hurricane recovery. At that point, there were 53. So, I decided to include myself in the book and keep the number at 54. Unfortunately, I lost one more who simply failed to respond. So, we are at 53. Let's hope that's a lucky number. To have a convenient source of information and updates for the book, I've created what Squarespace calls a Cover Page, which is like a single page website. It has three navigation options: Artists, Specs, and Updates. Select Specs to link to a pdf that provides a bullet-style run-down of the the specs for the physical book and content. Selecting Updates will link to the CREATIONS category on my blog, under which all things CREATIONS have and will be posted. Want to see it? Here it is! I'm so excited to share this stunning book cover. The work featured is a table lamp by Brazilian artist Rosangela Kusma Gasparin, and it is titled Forgotten Glass. 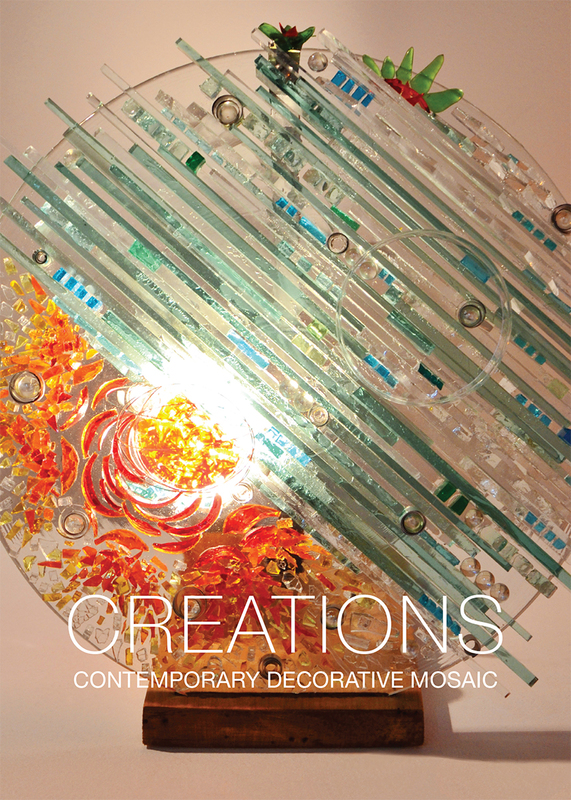 I feel like this mosaic expresses the creative, original, and explorative spirit that this book presents in its celebration of contemporary decorative mosaic. In looking into shipping costs for outside the USA, I have found that Amazon can ship books internationally for much less than I can. So, I've decided to sell it through Amazon, as well as my storefront. It will cost a few dollars more, due to Amazon's fees, but the total cost of book plus shipping will be a good amount less expensive than if I were to ship it myself. Wow! I am so pleased with how the book is coming along. It has truly been an honor and a joy to work with mosaic people from around the world. Part of the delight, as I have been receiving mosaic bundles of photos and other information from the artists, is to see so many countries represented. Currently, approximately 1/3 of the 54 features are complete, although still preliminary until final proofing and approval. This is remarkable, considering that the deadline of Oct. 31 is still more than a week away. The artists have, on the whole, provided excellent photos; where there have been issues with not being able to provide quality photos, I have been able to work with the artist to resolve things and make sure that they are represented. Out of all the stunning photos of all the amazing mosaics, I have chosen a tentative-almost certain cover image that I believe perfectly represents the spirit of this book. I feel it's too early to release the cover, but maybe in my next update, after the deadline and all the bundles come in. Although I am not ready to share the cover, I can share a bit about the format of the book. The book will be somewhere around 200 pages. It will be 11" x 8.5", portrait orientation, softcover. The book should be available no later than late winter-early spring 2018. However, it is coming along a little faster than I had anticipated, so it could be more like mid-winter, or late January-February. There will be a brief Introduction, written by me, and possibly an even more brief Preface. There will be a Foreword—fingers crossed—written by a very special someone with a broad and knowledgeable mosaic view, matched by their massive mosaic passion. Then, there is the heart of the book: the Presenting Artists. Each artist will have either a two or four-page feature. I decided against three-page features as that created flow problems. Each artist's feature starts on a left-facing page. Each feature begins with the artist sharing about themselves, in their own words, in their own fashion, about why and/or how they do what they do. Approximately 250 words provides several paragraphs on the first page of the feature. Depending on how long this narrative is, there may or may not be an image of their work on this page. Photos! You will immediately see the artist's work featured on the right-facing page, accompanied by a brief narrative—in the artist's own words—about each work presented. There are a good number of photos that lend themselves to being used in a very large format, either across an entire spread of two facing pages, or filling a single page. These photos are chosen to be presented in large format based upon their size in pixels, on whether the subject matter lends itself to such presentation, and on my attempt to be fair. In fact, there are more than I can feasibly exploit, but I'm doing my best! After the Presenting Artists section, and all the hundreds of images, there will be an Index of the artists, providing contact information. There will be an index of the works, by category. For example: Furniture, Architectural, Public Works, Exterior Decor, etc. There will be an Acknowledgements at the end of the book. So, that's it! I am so very happy and excited about how this is coming together. By way of this book, I am meeting artists from around the world, and seeing work that I've never seen before. It's completely awesome! AWESOME, AWESOME, AWESOME! 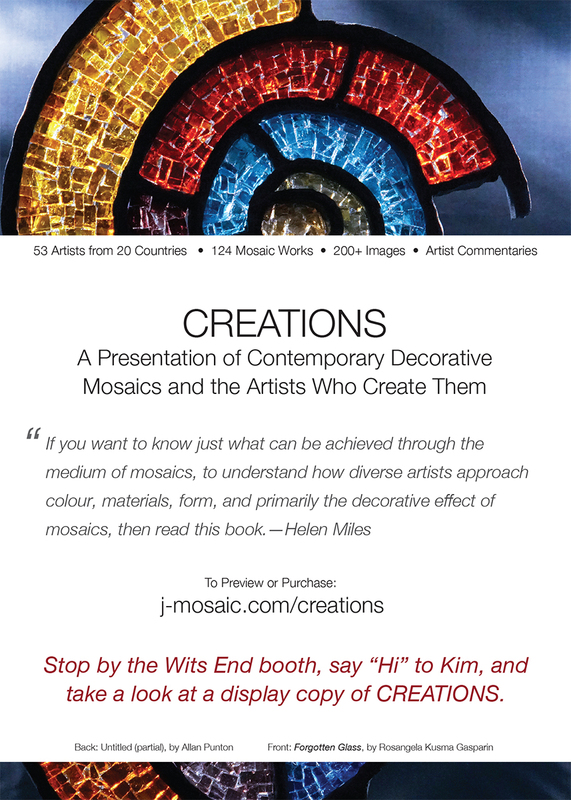 I'm trying out the the above as a title for my book featuring decorative mosaics. What do you think? So, the book is moving along! I received submissions from 147 artists from around the world, and reviewed over 700 mosaics. Yikes! I have selected submissions from 54 artists for further consideration. In the next couple of days, notifications will go out to everyone that submitted, informing them yes or no. I have pored over all the submissions, and made multiple passes. Even though the criteria for the project was as well-defined as I knew to make it, there were many works that gave me some struggle. The toughest decisions came down to making an admittedly subjective call on what I felt was the decorative nature of a work, especially wall pieces. My call had a very good response, especially after I extended the deadline. And especially in the last couple of weeks before the deadline. I am very thankful to the mosaic community for its interest and response, and for all those who helped to promote the call and get the word out! THANK YOU!! Sometime in November, I will have worked enough with the 54 artists to offer more definitive information about the book—the look and feel, so to speak. The submission deadline has been extended to September, 1, 2017. For more information or to submit, click the SUBMIT button below. Two bits of news: 1)There will be a book and 2) The deadline is approaching! 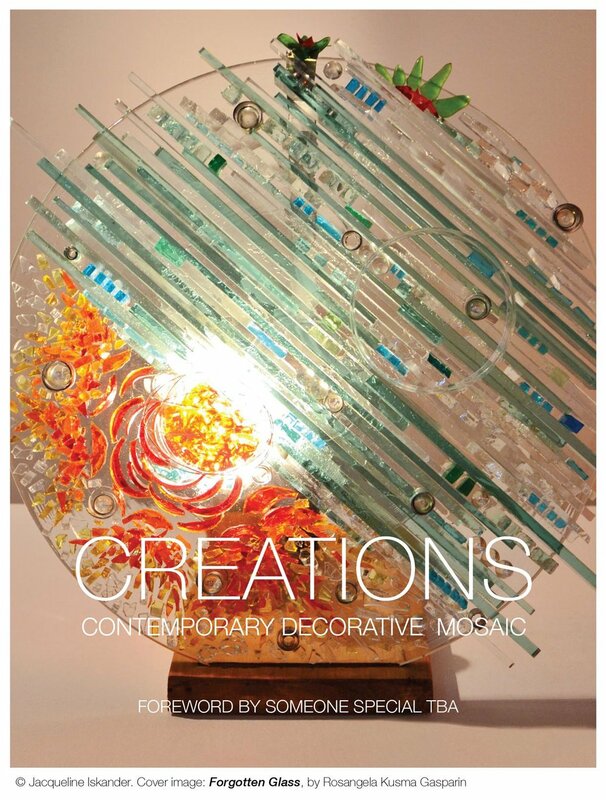 Based upon the submissions received thus far, I will be going ahead with a book featuring decorative mosaics!! However, I am still hoping for more submissions! Do you need more time? Should I extend the deadline to September 1? If I hear from you that another month would help, I will be happy to extend the deadline. If I don't hear from you, the deadline remains August 1. The book title, dimensions, number pages, and price are yet-to-be-determined. These decisions mostly depend upon the number of pages, which is primarily based upon the number of mosaics to be featured. More good news is that I will be able to sell it on my new storefront site, J MOSAIC, which will allow me to keep the price very reasonable for a softcover digital print book. I am pleased to announce that this tasty cookbook, featuring mouth-watering mosaics—and recipes, of course—is available for sale! I think there may be a few used copies of it still available on Amazon, but I am now able offer it on my new storefront instead of via Amazon. I can offer it for a little less—$22—and the price includes shipping. My apologies, but I am only shipping within the U.S. at this time. The book is an international collection of recipes and mosaic art. 63 recipes and 64 mosaics have been contributed by the international mosaic community. The collection of food and drink-themed mosaic art is diverse and robust. Includes conversion tables, quotes and tidbits, and a few personal stories. STUDIO BOOK 142 pages. 12" x 12"
STUDIO BOOK is something that I have been working on for at least the last nine months. I wanted to have photos in my studio of a couple of large commissions and some other works that I don't own anymore. But as I got started working on it, it kind of grew into a larger idea. 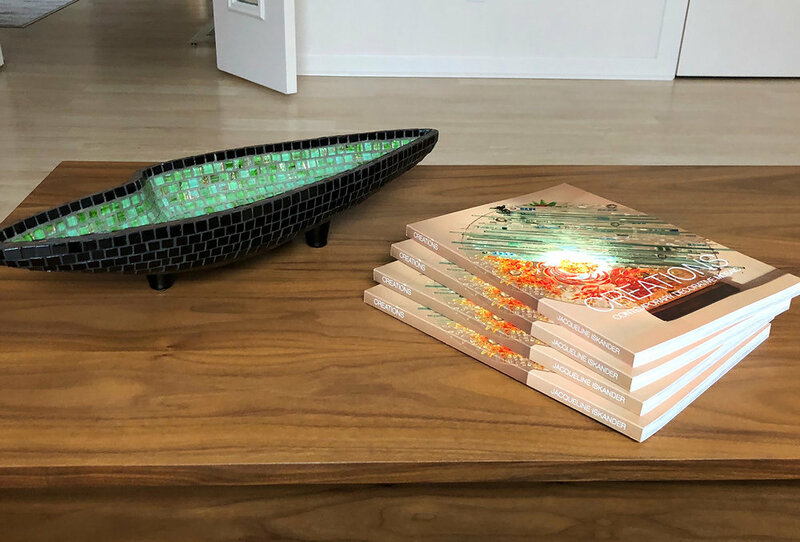 The book contains the usual gallery-type display of mosaics: Three series, 10 non-series works, some decorative pieces, a few Small Things, and 6 workshop/class projects. Additionally, I've included some WIP photos—Inside the Studio—for 6 of the works in the book. I did my best to add brief commentary where I thought it might be useful. This is a big book, 12" x 12", and has some really nice, large photos, as well as a few studio, not-the-greatest pics, in particular the WIP photos and ones of my earlier mosaics—the oldest one being from 1996. It will be another few weeks before it's officially finished, but it's finished enough for me to share some spreads with you. Over ten years ago, I found this book by Sarah Kelly. This was in my early years, when I was still doing a lot of decorative work, and before I had even thought about working with stone. I really loved the project shown on the pages (below left), created by Juliet Docherty. I don't know why I never tried it. I think I was trying to figure out smalti, or something, and veered away from vitreous glass projects. Even further back, in about 1996, I found Mosaic Mercantile as a vitreous glass supplier. I called and ordered a catalog and some small mixed sets. No internet ordering — it was all by phone. It was so exciting to receive the shipment of tiles; I thought that they were so beautiful, especially the metallic ones. That Gypsy mix is still my fave! This was before I even thought about trying smalti, much less knew where to buy it. Over the years, I've continued to buy vitreous glass for various mixed material projects, and I have a lot — a lot — that deserves to be used. Now, after so many years, I am revisiting Juliet Docherty's Decorative Panel project. I think that my Beginner's Mind exercises have given me the freedom to go back in time, more or less, so I've started a new mosaic that is inspired by the above project. That metallic vitreous is beautiful and I'm using a lot of it. After finishing a lower section, it was so strange to have mosaicked a large, flat area. And the little squares are so... square. I've got to work harder to let them be more loose.